There have been so many technological innovations since Star Trek premiered in 1966, that an inventory of Trek devices that HAVE been created is a never-ending task. The minute the new AirPods were announced, memes started appearing all over the web showing Uhura and Spock with their earpieces in, insisting that the technology dates back to the 1960s. Even our day-to-day tech makes some of Star Trek's devices look outdated, since we have phones in our pockets that take pictures, send messages, stream video, and access data from all over the world. Of course there are things we don't want created, too. The agonizer (or its next level up, the agony booth), the Borg, Ferengi Energy Whips, the Tantalus Field, and the Klingon "mind ripper" all come to mind. But there are still dozens of pieces of technology across Star Trek TV series and movies that are still unattainable, and we want them. From simple things, like the magnetomic adhesion that makes phasers and communicators attach themselves to uniforms, to that device that allowed McCoy to control Spock's body even after his brain was removed, there is much to covet. 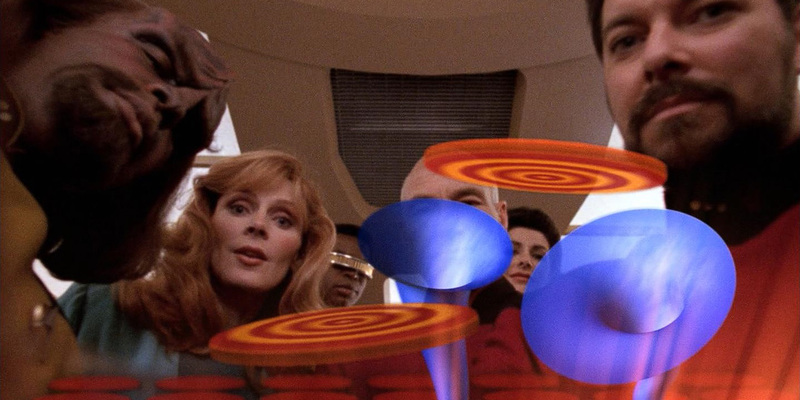 So let's take a look at 16 Star Trek Technologies We Wish Were Real. Admittedly, there have been some problematic androids on Star Trek. There were the occasionally homicidal ones on Exo III, found and tinkered with by Dr. Roger Korby, who turned out to be a human-android hybrid himself. Harry Mudd at least had some thoughts on how to make androids more fun, at least for him, but his androids almost imploded when presented with a logic paradox. Even Sargon, in all of his brilliance, couldn't create an android body worthy of his intellect. But then TNG came along with the greatest android of them all, Data, and THIS is the android we want. Data is everything an android should be. He's mostly indestructible (even after losing a head), capable of independent thought and personal growth, a lover of cats, a good friend, and the guy you want at your side whether your conflict is physical or intellectual. He can do things faster than humans, but really likes humans, and would tag along with you on any activity you were interested in. In "Measure of a Man," Picard was able to prove just how special Data was, and forced Starfleet to treat him as a sentient being with his own free will. Infinite diversity in infinite combinations, always. Plus, as Tasha Yar found out, he's fully functional. In Star Trek history, it's pioneer Zefram Cochrane who "discovered" warp speed, bringing our planet to the attention of the Vulcans and thereby introducing us to our first aliens. And then warp speed took us past the Milky Way and into the rest of the universe. Without warp speed, we couldn't boldly go where no one has gone before, let alone get back before our grown-up descendents would have to run the ship. Warp drive is a space propulsion system that's faster than light, which would give us speed beyond anything we've been able to even think about yet. So traveling to distant planets would no longer be a lifetime commitment, and the infinite vastness and variety of the galaxy would be ours to explore. Right now, a trip to Mars is a six month journey each way, with a required stay of about 18-20 months waiting for the planets to re-align for the journey back. Warp speed opens up the whole universe to us, making us explorers once again. Engage! 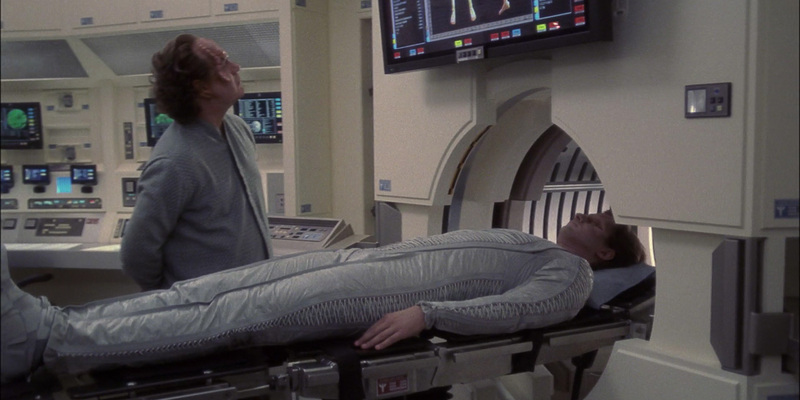 We know there's stealth shielding and whatnot, but so far, there's nothing really like Star Trek's cloaking device, an invention so worth having that Starfleet had Kirk and Spock steal it from the Romulans. Inspired, perhaps, by a combination of military technology and Wonder Woman's invisible jet, the cloaking device was able to hide ships both from the naked eye and from sensors, creating true invisibility. That didn't stop people from bumping into it, either in Star Trek IV: The Voyage Home or in an Enterprise Rent-a-Car commercial. Admittedly, we don't have spaceships yet, and we don't need to hide them from anyone either, but it's easy to imagine situations in which, let's say, a police force would benefit from this technology. Hostage situation? You could surround the place with police cars or even military vehicles and no one would know. Come to think of it, that's a little scary, but there are other applications, like the way scientists on Star Trek used cloaking technology to observe primitive cultures, (theoretically) without interfering with their development. It didn't always work out that well, especially when Data went rogue, but the idea is a good one. There's a reason so many kids opt for flute and clarinet in school: they're easy to carry. But for the pianists in the group who are struggling to find a way to practice and play when they travel, TNG had the solution: a roll-up piano you can carry in one hand. In the episode "Lessons," Captain Picard falls in love with a member of his crew, Lt. Commander Daren, and one of her many lovely qualities is that she's a musician like he is. They play together in Picard's quarters, but for their first real rendezvous, she takes him to the the fourth intersect in Jefferies tube 25, which is the most acoustically perfect spot on the entire ship. Picard brings the flute that he received in "The Inner Light" episode, where he spent an entire lifetime living on Kataan. She unrolls her piano, which looks like a piece of fabric with the design of piano keys, and plays, and it sounds just like the real thing. She's shown it to him before, but now he gets to hear in it all of its musical glory, and the sound is beautiful. She picked hers up on Mataline II, but we want to know where we can get one on Earth. In a world where Pokémon Go is loved all over the globe, "The Game," as it's generically called, seems like the logical next step. There are drawbacks, of course; in this much-loved TNG episode, Riker is first introduced to the game by Etana Jol, while on shore leave, and he brings to to the Enterprise, where everyone slowly becomes addicted to it. This turns out to be a Ktarian plot to get control of the ship, and gets foiled in the end by a tag team of Wesley Crusher (on a well-timed break from Starfleet Academy), the memorable Ensign Robin Lefler, and Data. So what's the appeal of this psychologically addictive game? Just watch the people playing it. They slide a little headset on, and use their minds to move little discs into horns that come out to meet them, and it's just sooooo satisfying. It stimulates the pleasure center of the brain, as you can tell by the awkward-to-overhear sighs and moans made by everybody who plays. Take out the addictive part, and somehow, this seems worth trying. Everyone sure looked like they were having fun! Sometimes, you can use something designed for bad, and turn it good. Such is the case with nanoprobes. Nanoprobes came to the Star Trek canon via the Borg, who used them to assimilate other races (to add to their perfection). Once they invade a person's body, they take over the existing cells on a microscopic level. 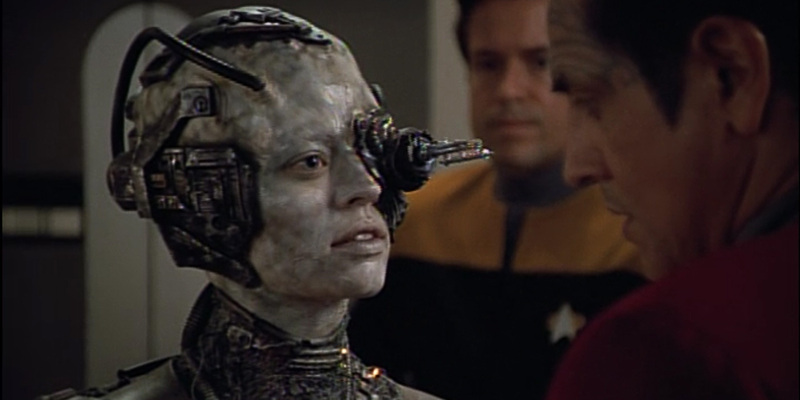 Seven of Nine, even after being freed from The Collective, had over three and a half million nanoprobes in her system, some of which were put to good use. They were used as a weapon against Species 8472, a previously undefeatable enemy. But they also fought viruses and diseases by attacking the cells that contained them, achieving successful results without invasive surgery. Like the Borg, nanoprobes can adapt, and it's here where their value lies. The idea of using them to attack specific cells, like ones containing cancer, makes them worth having, as long as Borg assimilation isn't one of of the side effects. On Star Trek, the dermal regenerator is a hand-held device that instantly heals cuts and burns without leaving a scar. It's used not just for injuries, but also for quick healing after surgery, making for a very speedy recovery. Right now, NASA is already working on this. In 2014, they signed patent license agreements with GRoK Technologies, to develop technology that would help regenerate bone and muscle, motivated by the loss of bone and muscle mass suffered by astronauts when the return from long space flights. Scientists at The Universty of St. Andrews and Harvard Medical School are also working on something similar, using lasers to heal wounds and avoid having to use stitches. But are we there yet? No. Those of us who aren't being used in scientific studies still have to wait for our wounds to heal, risking infection and additional injury. The idea of being able to walk into your doctor's office and get your cuts healed up instantly is a reality worth wishing for. Children and fearful adults will rejoice all over the world when this becomes a reality. There are reports that it's in development, and even in use in some places, but until we can get vaccinations and flu shots and cures administered to everyone this way, we're not there yet. In terms of consumer-readiness, the flu mist is probably the closest thing there is, and now doctors are telling us it's not really that effective. Damn. When Dr. McCoy gave a shot, he just pressed it against someone's skin and boom! Whatever had to get into their system was there. Against the arm, the neck, it didn't matter; it was quick, painless, and it worked. Instead of using a needle to cut through tender skin, a hypospray uses high pressure to send its contents into the body, avoiding the stabby-ness (and accompanying terror) of conventional injections. They didn't even need to improve it for any of the series or movies that followed, because they hit upon the ideal back in the 1960s. Sign us up. We've seen shields and force fields put to great use across every Star Trek series and movie there is. Deflector shields protect the ship from attack, and while scientists who watched the show insisted that if they actually worked, all those scenes of the crew throwing themselves around would never happen, it was always nice, as a viewer, to know the ship was safe and still get to enjoy watching everybody fly across the bridge at the same time. 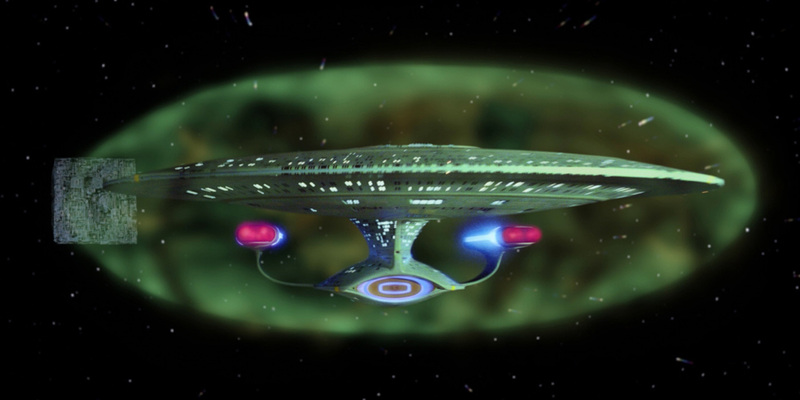 Ships had deflector shields, but force fields were used for smaller items that required similar protection. They could seal off specific sections of any deck, or put force fields around specific objects that needed protection. This brings to mind a number of everyday uses. Imagine if you could put up your shields around your home and not have to worry about burglars and other baddies prowling around. You could protect your campsite from bears, or take a nap on the beach without having to worry about someone snatching your wallet as they strolled by. No more baby gates, and no more stolen bikes. If you could make a force field small enough, you could even use it to stop people from taking your lunch out of the office fridge. Had a colonoscopy lately? Endoscopic exam? Mammogram? Prostate exam? Yeah... the medical scanners and biobeds we saw on various incarnations of Star Trek made all these uncomfortable procedures obsolete. Not only does that make for better, prettier television, it also fuels our fantasies of finding out exactly what's wrong with our bodies without all that unpleasant poking and prodding. Dr. McCoy's scanner always seemed very mysterious; it was a small cylinder that revealed information to him somehow just with lights and sounds. But he and the other Trek doctors also had medical tricorders, and just by running them across a patient's body, they could find out everything they needed to know. Organs, blood, arteries, bones, everything scannable without anyone having to wear a paper gown. If only. And the biobeds were even better, because the patient was monitored without the need for IVs or electrodes. Just lie there and the doctor can tell everything he or she needs to know, and probably fix it before you wake up, because you didn't have to be moved when you needed surgery. Yes please. The beauty of Star Trek's phasers was in their flexibility. While Star Wars' weapons were simply (but helpfully) destructive, Star Trek had already come up with a weapon that multi-tasked and spoke to the show's philosophy of finding ways other than destruction and war to achieve goals. 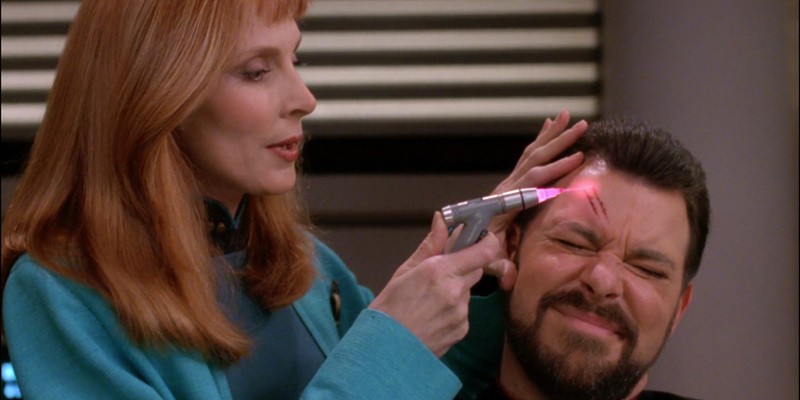 We have lasers, and they have all kinds of uses, but the settings on the Trek phaser is what made them really special. A powerful weapon of destruction? Absolutely. Also, though, a way to stun someone, meaning you could completely disable them without hurting them in the least, unless they hit something sharp on the way down. Remember "A Piece of the Action," when Kirk and team were on the gangster planet and chaos was about to break out? Kirk showed off his power by having Scotty stun everyone within a certain radius. It was a very effective demonstration of superior power, all without having ot hurt anyone. The result: peace. We also remember phasers being used to heat up rocks for a temporarily stranded Sulu and crewmates, and to cut through bulkheads, along with dozens of other uses. It's a weapon, but it's so much more, and the philosophy that created them with so many non-lethal options is one worth living by. Yes, we have Google Translate, and it's pretty good. We're making great strides, impressive ones, and now if you're traveling and you're lost, you can use your phone to translate your questions into any number of languages and then translate the answer back into English. That said, the real-time universal translator that actually makes what an alien is saying sound like they're speaking in English (or whatever your language is) right then and there, as they're saying it, is still not a reality and would be a massive game-changer. We can ignore for the moment that on Star Trek it also made aliens' mouths move as if they were speaking familiar words, because that's more of a TV thing than a feature of the device. But a real-time translator would join cultures and facilitate communication and understanding like never before, and is much needed in this time of dissension, rising xenophobia, and violence. Imagine if we could all understand each other instantly, from world leaders to strangers on the subway. The world would be a better place. The tricorder is such an obvious need that the XPRIZE Foundation has a global contest running that offers a ten million dollar grand prize to the team that creates a lightweight portable device that can non-invasively diagnose medical conditions. While they are focusing primarily on the medical uses, a tricorder on Star Trek had even broader usage, with its ability to scan, record, and analyze data quickly and efficiently. It's called a tricorder because of its triple functions: sensing, computing, and recording. Initially seen as a black box with "black finish and silver highlights" (as Dax noted admiringly) and a small screen, it eventually evolved into a more complex-looking device with an updated LCARS design and a touchscreen interface. This does seem like one of the most likely types of tech to come to fruition, given the fact that our phones can already give us access to almost infinite databases, and scan QR codes as well as take photographs. As great as they are, they're still a long way from tricorders. Tricorders could almost put a stop to terrorism by detecting bombs or anything toxic in the air, as well as send distress calls, function under water or intense heat, and tell us exactly why our machinery isn't working. We may be close, but we're not there yet. 3D printers are amazing, but they're not replicators, although scientists at Columbia University are coming pretty close, working on a 3D food printer you can use at home. Existing 3D food printers focus on foods that don't need to be cooked, like chocolate, but at Columbia, they're working on foods that can be cooked as well. The complexity of the process, however, is giving it a run for its money, meaning that that 3D printer-created paella is still a long way off. But it's not just about food. Star Trek replicators make clothing, toys, and spare parts, among other things. They make water, which could save lives across the planet and elsewhere. And even when they are being used for food, they go the extra mile, providing the plate, the cutlery, and the coffee cup. They then provide the perfect ecological step of recycling your leftovers, plates and all, into the next meal needed by somebody else. No more waste, no more want, which is what makes it such a perfect part of the Star Trek utopia. Of course, there were issues. Barclay suffered from a holodeck addiction problem, tied to his anxiety and shyness around the crew. But the psychiatric benefits seem like they'd outweigh the negatives, giving people a chance to work out their issues in a safe but utterly realistic environment. Imagine the possibilities for schools, camps, recreation, research, and more. Collaborate with anyone from Leah Brahms to Leonardo da Vinci. Show kids what history really looks like. Ask anyone what they'd do in a holodeck and they'll never run out of ideas. Who hasn't dreamed of this after watching just ONE episode of Star Trek? (Just skip that scene in Star Trek: The Motion Picture, though.) The transporter was invented as a way to save money on special effects by avoiding having the ship land, and to save time by not piling the crew into a shuttlecraft every time they had to go somewhere. It was created for TV with aluminum dust and high-intensity light, but the fictional theory was this: it would reduce you to atoms, take you apart, then reassemble you perfectly on the other side. No wonder Dr. McCoy complained about having his atoms scrambled across the universe; it definitely had a dark side. It split Kirk into two, with a good and evil one, it created a duplicate Riker in a Sliding Doors kind of move, and trapped Scotty for 75 years (although that was something he set up in the first place). Famous transporter detractors included Dr. Pulaski and Lt. Barclay from TNG, and Ensign Hoshi Sato from Enterprise. It doesn't matter; anyone who commutes to their job, has family far away, is weary of schlepping heavy bags through airport security lines, or misses their favorite restaurant on the other side of the globe is waiting for this one to be invented. Sadly, scientists are telling us that transporting quantum information is probably about as far as we're going to get. The newest Star Trek series, Star Trek: Discovery, premieres in May of 2017.